Are you on email overload? I receive literally hundreds of emails every day. It used to create feelings of overwhelm and frustration because I thought I had to act on each one. I guess it comes from my old fashioned upbringing that you should always respond if someone takes the time to send you a post. Snail-Mail has been pretty much replaced with E-Mail. Now that so much “posting” is automated (not like the old pony express days) anybody can post to thousands with the touch of a button. Times have changed. Is it good or bad? Social etiquette is necessary for online communications. Although I really want to know what my friends, associates, and clients are up to, I really cannot read all that is sent to me, and neither can you. That is, if you want to get anything productive done each day. No offense. It’s just too much to expect. What has evolved is a New Social Media Etiquette when it comes to online communication. Don’t expect that everyone will open and read the email that you send. And, don’t be offended if you don’t receive a reply. We are all in the same boat. Technology and convenience has made it so. The combination of Status Updates, Tweets, Automated social networking notices, Constant Email Contacts, etc., fill our in-boxes to capacity. To keep our sanity, I suggest a work process that I use called the 4-d’s. 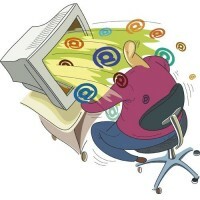 How to bring sanity back into our E-Mail Overload challenge? I use Gmail as my Email client. I like the feature of attaching tags and automatic filtering sorted by senders and other criteria. It makes it easy for me to scan my in-box and apply the 4-d’s action process prior to opening any message. Do It: If I recognize (know-like-trust) the sender AND am interested in the subject line right now, I leave it and this becomes an action item. Delegate It: If appropriate, I mark it and forward it for follow-up by my administrative assistant. Delay It: I archive it into the related topic folder so I can return to it when I have extra time (which is almost never). At least it is still available to retrieve as a result of a later search if needed. Dump It: Trash it or Mark it as Spam. This habit has given me peace of mind since I implemented it. So, if you send me an email and I don’t respond, please do not take offense. If you need a response, call me. Don’t text me unless you are a paying client. I don’t have unlimited text-ing on my call plan and it costs ME money to receive it. BTW, I think the “no-call list” and “voice mail” are great tools for the phone also. For another point of view, read Why Would I Want To Join Your List? This entry was posted in Marketing and Advertising, Observations, Selling and tagged email, Marketing, sell, Selling, social-networking. Bookmark the permalink. Sensible method. However. as one executive once told me, the problem begins when after you get rid of all the quick and easy stuff (the ones you dump, delegate, etc) you are left with 40 messages that you are really expected to “Do” – each day.